This paper empirically tests whether Irish and UK petrol and diesel markets are characterised by asymmetric pricing behaviour. The econometric assessment uses threshold autoregressive models and a dataset of monthly refined oil and retail prices covering the period 1994 to mid-2009. In addition to providing an appraisal of the existence of asymmetry in the Irish and UK markets, the paper provides an important methodological contribution. Tests of asymmetry in the literature normally partition the sample into periods of falling and rising international oil prices. This fails to account for price pressures coming from the equilibrium error of the cointegrating relationship. In particular, the possibility of conflicting price pressures arising from short-run dynamics in retail prices and responses to disequilibrium errors needs to be explicitly modelled. We take this issue into account in an econometric model and we highlight the importance of this distinction. In terms of the asymmetric behaviour of these markets, the paper finds no evidence to support the "rockets and feathers" hypothesis that prices rise faster than they fall in response to changes in the value of international oil prices. We study the strategic utilization of storage in imperfect electricity markets. We apply a game-theoretic Cournot model to the German power market and analyze different counterfactual and realistic cases of pumped hydro storage. Our main finding is that both storage utilization and storage-related welfare effects depend on storage ownership and the operator's involvement in conventional generation. Strategic operators generally under-utilize owned storage capacity. Strategic storage operation may also lead to welfare losses, in particular if the total storage capacity is controlled by an oligopolistic generator that also owns conventional generation capacity. Yet in the current German situation, pumped hydro storage is not a relevant source of market power. We examine the impact of real oil price shocks on labor market flows in the U.S. We first use smooth transition regression (STAR) models to investigate to what extent oil prices can be considered as a driving force of labor market fluctuations. Then we develop and calibrate a modified version of Pissarides' (2000) model with energy costs, which we simulate in response to shocks mimicking the behavior of the actual oil price shocks. We find that (i) these shocks are an important driving force of job market flows; (ii) the job finding probability is the main transmission mechanism of such shocks; and (iii) they bring a new amplification mechanism for the volatility of the labor market, and should thus be seen as complementary of labor productivity shocks. 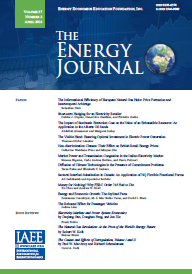 Overall we conclude that shocks in oil prices cannot be neglected in explaining cyclical labor adjustments in the U.S.
Brazil is the only sizable economy to date to have developed a homegrown ubiquitously-retailed alternative to fossil fuels in light road transportation: ethanol from sugar cane. Perhaps unsurprisingly, the uptake of flexible-fuel vehicles (FFVs) has been tremendous. Five years after their introduction, FFVs accounted for 90% of new car sales and 30% of the circulating car stock. We provide a stylized model of the sugar/ethanol industry which incorporates substitution by consumers, across ethanol and gasoline at the pump, and substitution by producers, across domestic regional and export markets for ethanol and sugar. We argue that the model stands up well to the empirical co-movement in prices at the pump in a panel of Brazilian states. The paper offers a case study of how agricultural and energy markets link up at the very micro level. Coal-fired power plants face potential difficulties in a carbon constrained world. The traditional advantage of coal as a cheaper fuel may erode in the future if CO2 allowance prices increase. When would it be optimal to abandon a coal station and obtain its salvage value? We assess this question following the Real Options approach. We consider the case of a coal plant that operates in a deregulated electricity market where natural gas-fired plants are the marginal units. We assume specific stochastic processes for the fundamental uncertainties in our model: coal price, natural gas price, and emission allowance price. The underlying parameters are derived from actual futures markets. They are further used in a three-dimensional binomial lattice to assess the decision to abandon. We draw the optimal exercise boundary. Sensitivity analyses (regarding fuel prices, allowance price, volatilities, useful life, residual value, thermal efficiency, safety valves in carbon prices, time step) are also undertaken.